I spent a long time thinking about how to design a system for long-term organization and storage of subject-specific informational resources without needing ongoing work from the experts who created them, only to realized I’d just reinvented libraries. We started by asking: millions of people are conspicuously praising every outgroup they can think of, while conspicuously condemning their own in-group. This seems contrary to what we know about social psychology. What’s up? We noted that outgroups are rarely literally “the group most different from you”, and in fact far more likely to be groups very similar to you sharing almost all your characteristics and living in the same area. We then noted that although liberals and conservatives live in the same area, they might as well be two totally different countries or universe as far as level of interaction were concerned. Contra the usual idea of them being marked only by voting behavior, we described them as very different tribes with totally different cultures. You can speak of “American culture” only in the same way you can speak of “Asian culture” – that is, with a lot of interior boundaries being pushed under the rug. Research suggests Blue Tribe / Red Tribe prejudice to be much stronger than better-known types of prejudice like racism. This essay is bad and I should feel bad. I should feel bad because I made exactly the mistake I am trying to warn everyone else about, and it wasn’t until I was almost done that I noticed. … If you think you’re criticizing your own tribe, and your blood is not at that temperature, consider the possibility that you aren’t. 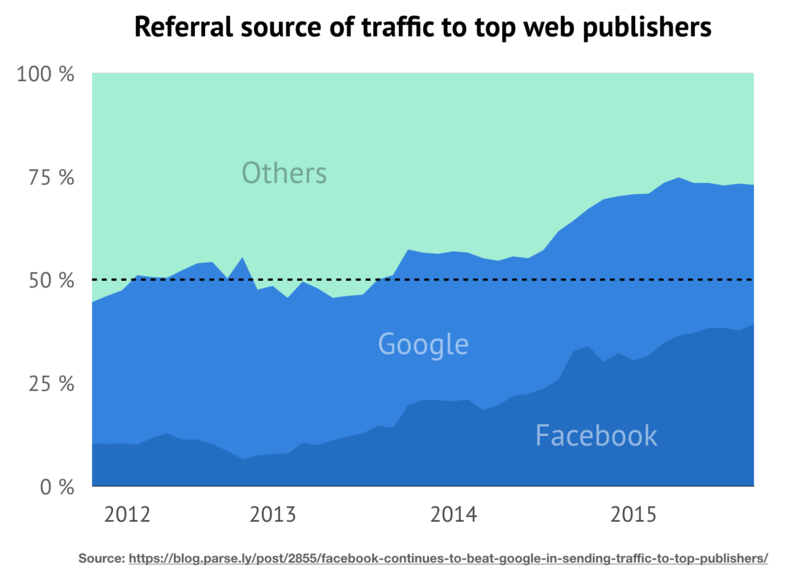 The underlying dynamics of power on the Web have drastically changed since 2014, and Google, Facebook, and Amazon (respectively, GOOG, FB, AMZN) are at the center of a fundamental transformation of the Web. The original vision for the Web according to its creator, Tim Berners-Lee, was a space with multilateral publishing and consumption of information. It was a peer-to-peer vision with no dependency on a single party. Tim himself claims the Web is dying: the Web he wanted and the Web he got are no longer the same. Perhaps a future with great user experience in AR, VR, hands-free commerce and knowledge sharing could evoke an optimistic perspective for what these tech giants are building. But 25 years of the Web has gotten us used to foundational freedoms that we take for granted. We forget how useful it has been to remain anonymous and control what we share, or how easy it was to start an internet startup with its own independent servers operating with the same rights GOOG servers have. On the Trinet, if you are permanently banned from GOOG or FB, you would have no alternative. You could even be restricted from creating a new account. As private businesses, GOOG, FB, and AMZN don’t need to guarantee you access to their networks. You do not have a legal right to an account in their servers, and as societies we aren’t demanding for these rights as vehemently as we could, to counter the strategies that tech giants are putting forward. The Web and the internet have represented freedom: efficient and unsupervised exchange of information between people of all nations. In the Trinet, we will have even more vivid exchange of information between people, but we will sacrifice freedom. Many of us will wake up to the tragedy of this tradeoff only once it is reality. The case for being sanguine about competition in the tech industry rests on the potential for incumbents to be blindsided by a startup in a garage or an unexpected technological shift. But both are less likely in the data age. The giants’ surveillance systems span the entire economy: Google can see what people search for, Facebook what they share, Amazon what they buy. 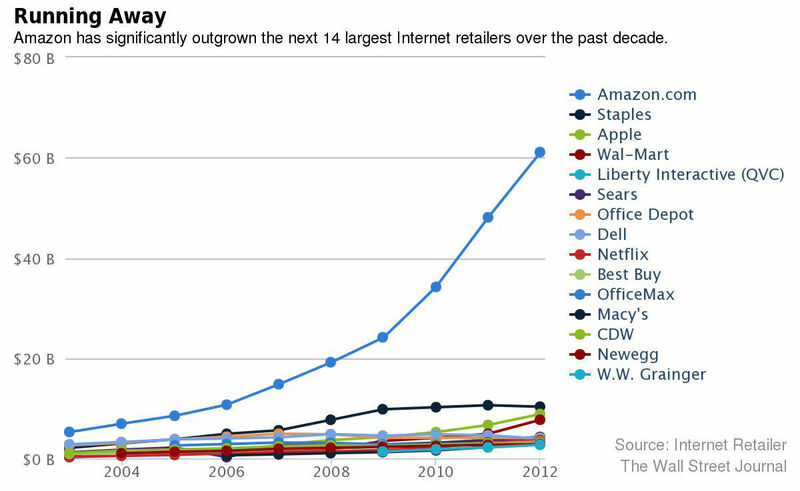 They own app stores and operating systems, and rent out computing power to startups. They have a “God’s eye view” of activities in their own markets and beyond. They can see when a new product or service gains traction, allowing them to copy it or simply buy the upstart before it becomes too great a threat. The first is that antitrust authorities need to move from the industrial era into the 21st century. When considering a merger, for example, they have traditionally used size to determine when to intervene. They now need to take into account the extent of firms’ data assets when assessing the impact of deals. The purchase price could also be a signal that an incumbent is buying a nascent threat. … The second principle is to loosen the grip that providers of online services have over data and give more control to those who supply them. Rebooting antitrust for the information age will not be easy. It will entail new risks: more data sharing, for instance, could threaten privacy. But if governments don’t want a data economy dominated by a few giants, they will need to act soon. There is no comprehensive collection of data in the U.S. about women who died when they were pregnant or had recently given birth. 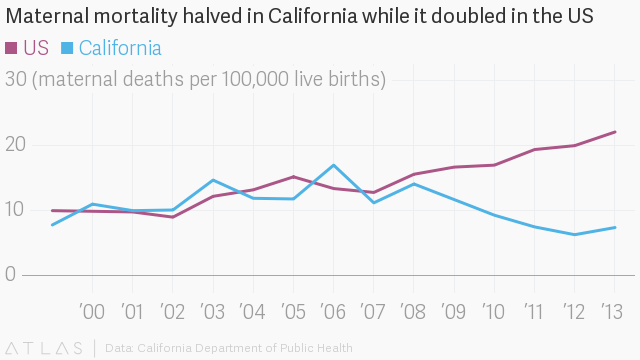 Part of the story of why is hidden in the numbers—and the ones about maternal deaths in the US are enough to give epidemiologists a serious headache. … It’s estimated that the spotty reporting that resulted missed up to half of all pregnancy-related deaths. Unfortunately, the official CDC data are not updated to reflect the findings of the committees, which means the national numbers on record aren’t just likely to be inaccurate—they are known to be wrong. This is why there is such a discrepancy between the estimated ratio, 26.4 in 2015, and the numbers shared by the CDC (in the chart above). 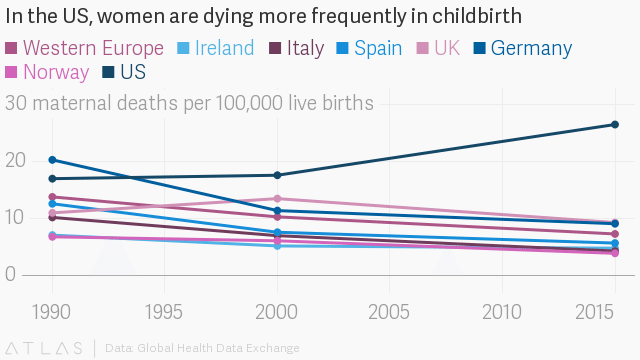 It is also one of the reasons why the US has failed to publish an official maternal mortality rate since 2007—“it’s inexcusable,” comments MacDorman. 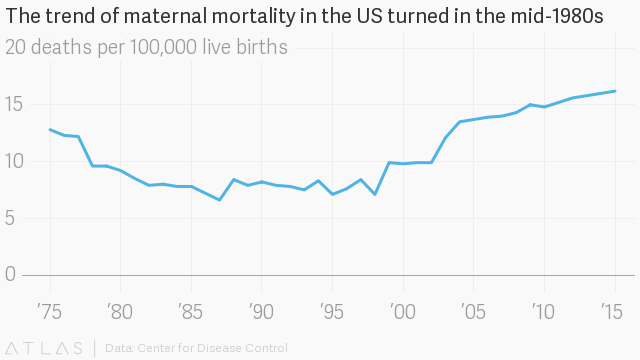 While most of the world has drastically reduced maternal mortality in the past three decades, the US is one of just a handful of countries where the problem worsened, and significantly. 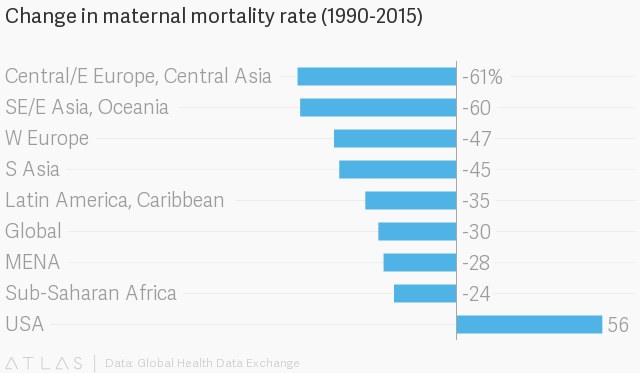 … It’s an enormous problem to tackle for sure, but it is also one where the scope for improvement is as great as the gap between maternal mortality rates in the US and other countries of comparable wealth. “The whole idea that in our backyard here is a problem [like this] when we have NGOs that do this work in Africa” was baffling, Rao told Quartz. “Of all the health issues affecting the US, [maternal mortality] is the most unacceptable,” he says.